Jiu-Jitsu puts a strain on the back of up to 80% of practitioners according to some incidence reports. Do you have an issue with your back? Are you in pain? Disc herniations are much more common than previously thought. Further, disc herniation may be asymptomatic. They may cause mild to moderate or confusing symptoms but they can also lead to serious, devastating and permanent injury. Is your lower back on fire when or after you play guard? Does sitting make your lower back really painful and stiff? Are you in pain when you try to put your socks on? So what are some basic physio therapist recommended exercises you could be doing to make the pain better? Bad posture and pain limit not only everyday life but will also make training jiu-jitsu difficult. 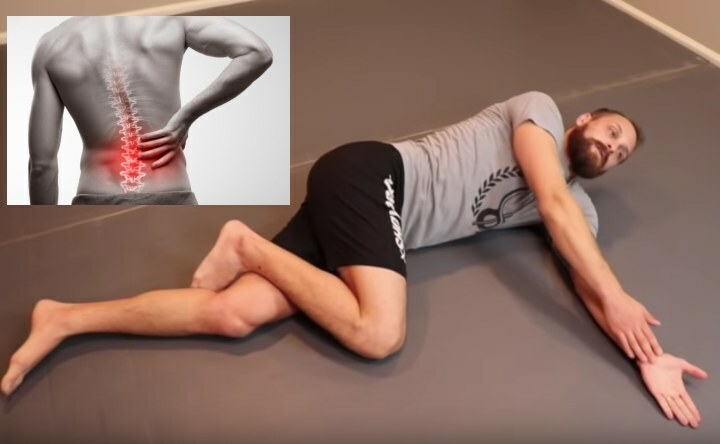 Corrective exercises as well as mobility techniques are extremely important to prevent injury, improve function, and ultimately allow you to train harder and more frequently with less likelihood to get injured. It is much easier to prevent an injury than it is recover from one. This video has 3 techniques that are effective and very important to address your impairments and limitations and ultimately help prevent injury. Only perform these exercises to comfort. 2. Archer exercise. 10 repetitions. 3. Standing trunk bends with arm reach. 10 repetitions.